Wild Growth has had a few different paintings over the years – not as many as it should have, in my opinion, as they allow things that are just as powerful in the new sets and probably less popular – but the original might still be my favorite. It’s such a lush and inviting environment, although if it were real we’d have to be careful of the Craw Wurm that’s undoubtedly lurking just behind the flowers! Mechanically, it’s superficially similar to Llanowar Elves (also debuting in Alpha!) as a card that costs one green mana and provides one green mana. Not being a creature carries certain disadvantages, as attacking and blocking are fundamentals of Magic, but it opens up a lot of extra interactions. It draws a card with Verduran Enchantress, and it provides much more than just one green mana in conjunction with Ley Druid and the like. And yes, I suppose “they” would undoubtedly argue why Wild Growth isn’t in the new sets alongside things that are just as powerful and probably less popular. I say: if you really want Theros to be an enchantment world, maybe you should consider cards like this which push enchantment-based interactions rather than another +1/+1 counter mechanic. 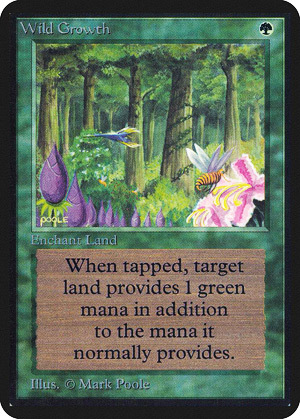 One of the original cards of the game, Wild Growth has since been usurped by other mana-accelerating Auras. The idea is similar to Llanowar Elves, going from one mana to three, with the upshot being that both Enchantments and Lands are harder to remove in the present day than creatures were. The downside, as it were, is that you make the mana at the time the land gets tapped, so you’re committing all the same. It occupies a similar place as Utopia Sprawl, which asks for Forests but produces mana of any color on top of it. Wild Growth isn’t bad, but there oft are alternatives that outclass it, and it also has not seen Standard since 7th Edition, which definitely limits where it can be played. It’s a way to keep making mana upon mana, but other cards can do the job better…still, if redundancy is desired, Wild Growth can supply it.